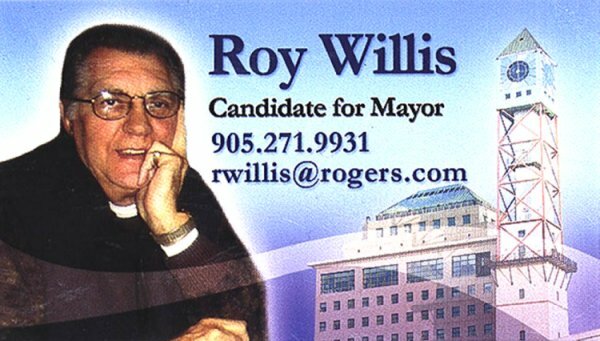 Mr. Willis has been a part of the Mississauga/Malton political scene for decades. He has likely lost count of the times he has addressed City Council on behalf of the community. He is one of those people that when he enters Council chambers they all take note, as he could ask them the questions that will be hard to answer and not look foolish in the process. On one of Mr. Willis regular visits to City Council chambers for a Council meeting, as he was glancing through the Apr. 12-06, Council agenda he came upon an item that he knew should not be. Unlike most people he knew the legal history of a certain area, that the City appeared to be ready to approve homes in, an area the OMB had made a precedence setting ruling (OMB Order 1138), that said this should not be allowed. At that OMB Hearing Mr. Willis was quoted as saying living in Malton as akin to "noise toxic soup" and the OMB followed his lead. How the City write the minutes of Mr. Willis questions is interesting to. Not being afraid to address Council on the spur of the moment he addressed Council regarding this matter and it appears - stopped it in its tracks. Why? How can a ruling that does not allow homes due to noise levels on one side of the street but allows them on the other side? How is this consistence in good planning policies? How is that fair, to builders? The Greater Toronto Airports Authority (GATT), had appealed (and won), to the Ontario Municipal Board to not permit the building of new homes under the routs jets take landing & taking off. This was done by the GATT to protect itself from those so greed as to build homes for people in areas where the noise levels from the Airport (jet traffic alone) would be harmful to homeowners and their families, so how can being across the road make this expense, recent and precedence setting ruling be rendered irrelevant? Surely this was not just a waste of money by the GATT? Why didn't the City's "world class" staff not present all the relevant facts and put them on the public record for the public to read in the Council Agenda? After all, this recent OMB case, regarding the noise levels of jets from the Air port, was across the road from this proposed residential development! Why didn't Mark Rogers, John D. Rogers & Associates Inc., note the OMB cases that could impact this Subdivision Application? They are on the record saying - "Mr. Rogers explained the surrounding land uses". Yes - why didn't these "professionals" not make note of the recent and relevant OMB ruling, (at least from what I can see and been told, they had not)? Will be looking into this matter more to find out if they did but it was not noted or if it was just omitted. Do not see it in the official records and when City officials were questioned in Council chambers they did not specifically refer to it, which would show they knew about it and that it was properly addressed. After all, not noting and/or fully addressing a legal Order that would likely deny approval for a "Subdivision Application to permit eight detached dwelling", is such key element, it makes me wonder ............. just how could it have gotten this far? And why is there no mention of concerns about noise levels when building homes almost directly under a run way? Does no one in the City give a damn about such things? I understand that item was not approved by Council and that speaks volumes. as given to City TV in Oct.